Just bored and wondering ? Does anyone else ever look through the orphans section that's appropriate for your model and leave depressed? Lol I look everyday for anything that might be associated by vin to my car and there is nothing, yet there's thousands of items with everyone else's vins..... I'm just crying in my cereal! Thanks for listening. Re: Just bored and wondering ? Chris you are not alone. I have passed along lots of things for others, hoping for good karma back someday. I'm always checking through orphan section documentation list, but it hasn't been updated in almost 2 years. Couple VINs close to mine, but no direct hits yet. It is a long shot but there is still stuff out there. I know a guy who has 7 or 8 muncies and about half have vins. No Norwood,but shows there are still there. Heck even my 64 vettes NOM engine is a 65 327 350HP with a vin that I should post on a vette site but I have not yet. Just hope the finder is not one of the guys that will hold it for ransom. I happen to think there was so much swapping of motors and transmissions, that many of them are still out there. The problem is that they are in other cars, and 90% of classic car owners have no clue what VIN stamps are on their motors and transmissions. I have helped a couple of guys locate their original motors. A few years back I had a 67 Corvette 327/300HP HE long block obtained in the early 80's. I was about ready to junk it 3 years ago for scrap metal except for the oil pan & some other items but a NCRS judge friend insisted on putting it on the NCRS orphans list so I gave him the information even though I am a NCRS member. Reason I did personally was I had been told years prior that 67 had been turned into a big block car and assumed incorrectly it was a waste of time. Well he puts the info on the NCRS website and bingo, about 6 months later I got a call from my friend that a person in Canada called him and said it was out of his car. His car was born with the long block I had but he confirmed his car now had been changed into a L71 big block. LOL It apparently had changed hands many times over the years and he said he knew when purchased it was not a real L71 car. Well he purchased it and it now resides in Canada with the Corvette it was born with. His plan was to assemble/restore and place it on an engine stand with the car. The big block was going to stay where it was. The reason I had obtained the aforementioned HE long block was to possibly put in our 67 Corvette since it was originally a low horse 327, but it had a DZ block in it when we purchased in the early 80's. Since it was an early DZ block the vin was right there on the pad and I was able to find the owner In 2008. He purchased the car in 1981 with a 350 in it. That engine was also reunited with its original mate so I'm two for two and both were tied in one way or another with our 67 Corvette which we still have! Some of you may remember a few years ago that I listed an '69 L78 block that turned out to belong to an existing car - the current car owner and I could never make the deal to exchange it, so it still sits in the garage waiting the day when I can complete it and use it in my own L78 (which has a badly damaged original block). Not everyone places a large premium on numbers matching motors for one reason or another, I guess. On the other hand, I have a VIN numbered MO on the stand (that I wish I could find the Z it goes with), posted in the Orphans section with the rest of the forlorn orphans for a long time now, still no response. I wish I had the national database access that law enforcement uses to use for detective work on ones like this - it would be a modern-day treasure hunt for sure. I’m in the same boat as everyone else, well somewhat. Although the car is my dad’s it still holds a special place in my heart. As a kid growing up it was really the only thing that brought my stepfather and I together in my eyes. Working on the car with him was the best time ever. Annoying the hell out of him with questions left and right to the point I felt like a belt was going to be the next tool he picked up was what I lived for LOL. Starting from day one he taught me original is the way to go. At the old age of 29 浪 I feel like I’m a kid again because every single morning I wake up checking the site is the first thing I do. Anything to learn and build my knowledge more and more makes my day. Even when I was in Iraq and Afghanistan I made it a point to check the site when those rare occasions came I could hop on a computer with internet access. I would give anything to find his block for him. Just like others have said, I believe many blocks are out there it’s just many don’t know what they have. To bad the L78 car owner couldn't trade you out with another L78 block for your car. it may take some time but I think the block may still be here in southern California. The car needs many little parts though, so I have plenty to keep me busy for quite some time. I think most guys can fully enjoy their car, and just keep an eye open if good fortune comes their way. Jmoore start a new thread and post some pics and info on your families Camaro. I loved the re-telling of you learning with him. my 10 yr old son is at that stage now, many good times. I am always quizzing him while we are turning wrenches. I only knew about skateboards and racing BMX bikes at his age. I think the common thread between my son and I, is the early fascination with Hot Wheels. Years ago I bought a 350 4 bolt block from a customer that was going to a big block in his race car. I went over the numbers and it turns out to be a 1970 corvette LT1 with trans ign. I searched the partial vin hoping to reunite the motor and car. I got a hit and there it was at a dealer in the US as a restored numbers matching original motor. They had the time slips from a local drag strip here in Ontario in the document binder. They had the build date off by one day! I chuckled to my self as I'm sure they wouldn't have been real happy to talk to me! It is good to hear the father sons doing cars together (or other stuff). I am not sure my two sons can check oil correctly. In fact they are both in their 30,s and neither have learned to drive a manuel shift. My best memories of my dad are the day he brought home a 327 for my 61 impala and told me to install it while he was out of town. I was so proud when he got home and I actually had it running. A few years later after a cam change I had to explain to him that he could not adjust the carb to get the idle to smooth out. Thata a good story Kelly. How old were you when he left you with that task? I have a 66 corvette HE coded 327 complete with it's original M-21 trans behind it. My father bought the complete setup with original shifter and all back in about 1971 or so while living in Cincinnati at the time. It's a low mile example, never rebuilt and still runs fantastic. Only piece changed is the carb. Searching for the car never crossed my mind. I have pics of that engine when I cleaned it up a few years ago and it had grease markings all over the block, including a BIG "HE" written on the side of it. Kind of a neat piece we've kept around all these years. This is an "almost". Long 'bout 1986-7, after my first daughter was born and in daycare, I found out the sitter's son (who is few younger than me), had an X33 Z that he had bought nearly the same time I had purchased mine (3/73), and still had it. He brought the car over to my house one afternoon, and let me go over it and drive it to boot. I got the VIN with his permission and did a title search on the car through the state (doing the detective thing), and got the entire title history, dealer invoice and MSO that documented the car. 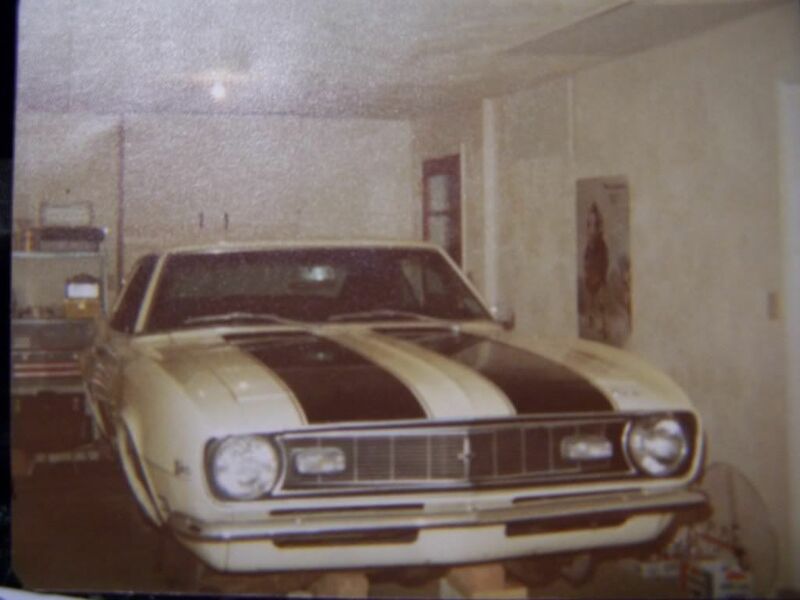 Over the years he had toyed with selling the car; before I moved away from him in '92, I made one last attempt to buy the car from him, but he would not sell it at that time. Flash forward more than several more years - I heard he had sold the car. I managed to track it down through Google, but by then the car had sold again. I tracked the new owner down through CRG and made him a present of the paperwork that documented the history and originality of the car (at no charge, the way it should be). I just wished I could have bought and kept it with me instead of just owning the paperwork !